The other day we told you about the artwork created specifically for an online version of The Hitchhiker's Guide to the Galaxy game that was created for the new BBC editions of the Hitchhiker's radio drama that came out a few years ago. 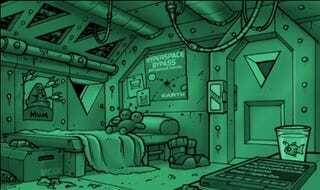 This image, featuring a cartoony version of the Vogon Captain's quarters, was part of a set created for the same game. We particularly like the attention to small details, like the Hyperspace bypass plans on the wall, and the Babel Fish in the cup. Artist Nolan Worthington creates artwork for numerous projects, including some cool environments and vehicles for an unnamed science fiction project for toymaker Mattel. His art varies from architectural to cartoonish, and he's also in a band called The Cans, which makes him a real renaissance man. His artwork along with Andrew Wyld's helped the game win a BAFTA award. Not too shabby. What If The Moon Crashed Into The Earth?